Consider a Candycation This Summer! While we don’t typically have candy bars on the brain while the temperature outside climbs into the 90’s, what we do have on the brain is summer fun in the sun! And one of our favorite places to visit on these warm and wonderful days is Hersheypark in Hershey, PA. As fellow Pennsylvanians, we’ve made quite a few trips to this park over the years, and can honestly say it’s one of the best there is. (For the record, Pennsylvania amusement parks Dorney Park & Wildwater Kingdom and Knoebels Amusement Resort are awesome, too!) If you’ve never been to Hersheypark, we recommend making a two-day trip of it if you can, as there is quite a bit to check out and enjoy. 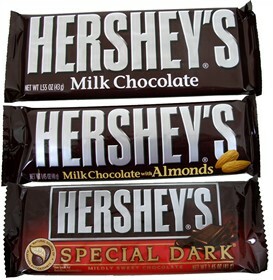 We usually begin our Hershey adventure at Hershey’s Chocolate World, where you can take the mouth-watering Chocolate Tour Ride. You get a fun and informative peek inside the making of Hershey’s candy, and the ride is filled with the rich aroma of sweet, spectacular chocolate. The ride is slow-moving and appropriate for all ages, making a family-friendly treat everyone is sure to love! After you’ve taken the tour, you can see all the other fun that Chocolate World has to offer, or you can step outside to line up for the rides at Hersheypark, which include Kiddie Rides, Water Rides, and my favorite rides of all – roller coasters! Hersheypark boasts quite an impressive lineup of coasters, with my top 2 residing in the Comet Hollow area of the park – the Sooperdooperlooper and the Comet. The Sidewinder is also a uniquely thrilling coaster, and resides in the Pioneer Frontier section of the park with 3 other coasters. We hope that if you give Hershey a visit you’ll enjoy your time there as much as we always do! We also hope that as long as you’re in Pennsylvania, you’ll take a swing by our brick-and-mortar Blair Candy in Altoona, PA – about 2 ½ hrs. from Hersheypark. We’ll have plenty of the Hershey’s summer-friendly favorite – Twizzlers – in stock and ready to enjoy! Cookout-Themed Candy is Perfect for Summer Parties! If you haven’t already fired up your grill this season, chances are good the next couple weeks will have you dusting it off and preparing your taste buds for the best hot dog and hamburger you’ve had since September! Cookout Season is upon us, with all its mouth-watering macaroni salad, frosty glasses of lemonade, and aforementioned burgers and hotdogs, whose deliciousness transcends even the Christmas ham (though I’ve never had that on the grill…hmmm…) And while it really does only take a few dishes, a few lawn chairs, and a few friends and family members to make a cookout a success, we have some simple ideas to add some extra fun to the table – literally! Gummy Mini Burgers – Don’t worry, you aren’t going to have to invest in a teeny tiny burger flipper – these sweet gummy patties are ready-to-eat and perfect for picnics and cookouts. 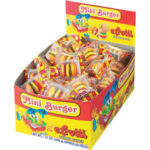 Each box comes packed with 60 mini burgers from the popular efrutti brand of gummy goodies. The burgers are individually wrapped for freshness, which also makes them easy to leave out without risking them getting dirty or attacked by curious flies, bees and mosquitoes! 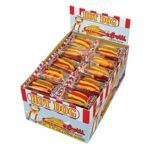 Gummy Hot Dogs – Just like you won’t need an itty-bitty burger flipper for the snacks above, you won’t be struggling to line up ketchup and mustard on a baby bun for the efrutti gummy hot dogs. These are oh-so-cute and just as cookout-friendly, being some of the softest, freshest, fruitiest gummies you’ve ever enjoyed! 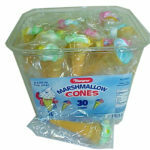 Marshmallow Ice Cream Cones – Ice cream has always been a difficult summer treat, despite its summery amazingness. The battle to ‘make it work’ has raged on since ice cream and summer began, and as much as these 2 adore each other, fate does not appear to be on their side. That’s where Marpo marshmallow ice cream cones step in to save these star-crossed lovers! Fruit Salad – You’ve got your burgers, you’ve got your hot dogs, and you’ve got your ice cream…what else is there? A fruit salad, of course! We can’t help you with the regular fruit salad; you’re going to have to hit the fruit stands for those ingredients. But for the ‘candy fruit salad’ we’ve got you covered! You can set up a small ‘candy bar’ with plastic or paper cups or bowls, and set out different ‘fruits’ with spoons for friends and family to build a candy fruit salad. Summery, sweet options include: Gummy Melon Rings, Gummy Peach Rings and Gummy Berries. Mmmm! 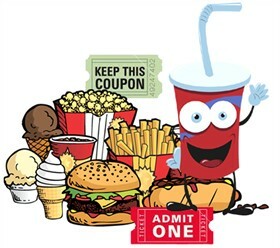 Concession Supplies – From French Fry Trays to Banana Split Boats! At Blair Candy Headquarters, we’re seeing our concession candy orders climb as stands across the country run low on everything from Quench gum to Slim Jims. But it isn’t just the sweet and salty stuff we offer at Blair. We’ve also got a great selection of concession supplies that are affordable and durable. We know you don’t want your fans walking around with nacho cheese all over their shirt – especially if they’re wearing a team shirt! So we offer containers and trays that are built to last through the last bite, be it a fresh pile of fries or a hot dog with the works. Snow Cone Cups – 6 oz. – 200 ct. for $7.75 – Less than 4 cents per cup! While most of us grumble when we get too much ice in our soda, sweet, flavored ice in a snow cone cup is a completely different story! There will be no grumbles. There will be no mumbles. There will only be ‘mmmm’ s. It’s also worth noting that since snow cones are just ice and a little syrup, their profit margin can be much higher than many other snacks. Also, fans in the stands might bring along their own soda in their purses and backpacks, but there aren’t a whole lot of people walking around with their own snow cones! French Fry Trays – 250 ct. for $7.30 – Less than 3 cents per tray! There are few things in life as universally appreciated as French fries. Sure, there will always be one or two people in a crowd that claim not to care for them, but the only reasonable explanation for that would be that they’re lying. Or perhaps they never had a French fry and are embarrassed. Maybe a French fry bit them when they were a child? I’m not sure, really. But I am sure that most people love them, whether they dip ‘em in ketchup, cover ‘em in salt, pour on the vinegar, shake on the Old Bay, or customize them in any other of the countless ways that are all delicious! Banana Split Boats – 75 ct. for $27 – Just 36 cents per boat! Our banana split boats are super sturdy and sized just right for an oh-so-delicious banana split. This delectable summer treat can easily go from scrumptious to sloppy in the blink of an eye, so we made sure to stock a durable boat that was up for the challenge. You’ll appreciate that they’re easy to work with, and your concession stand shoppers will appreciate that they have something sturdy to hold while they savor every last lick. Banana splits are typically a more expensive concession stand snack, so it helps to invest in a better quality container that will keep all the goodness in the boat where it belongs!